The Alaska Yukon Adventure combines four of the most dramatic and spectacular stretches of highways in the far northwestern part of North America into a once in a lifetime bike tour. 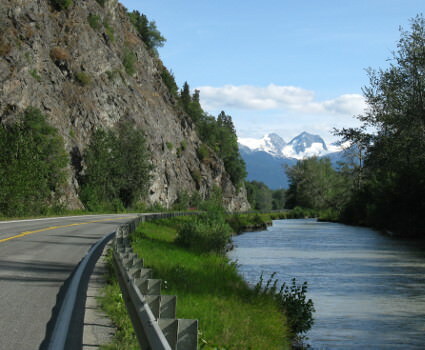 The trip combines the magnificent Haines Highway, with the Kluane lake section of the Al-Can Highway, plus the most beautiful stretches of Alaska's Glenn and Richardson Highways. Add in Pedalers' outstanding selection of campgrounds and small hotels, plus our famed camp cuisine both delicious and imaginative, and you have a bike tour unlike any other. The bike adventure begins by ferry traveling the Inside Passage to historic Haines, Alaska and the start of the Haines Highway. Three days of cycling through never ending alpine landscapes and glacier filled valleys, take us from the coast into the relatively unpopulated Yukon Territory of Canada. 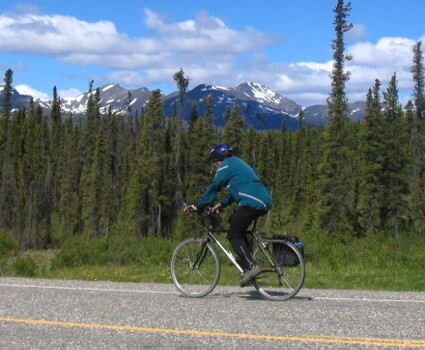 Turning westward along the notorious Al-Can Highway (now called the Alaska Highway), we enjoy cycling along the blue waters of Kluane Lake and the remote wildernesses of the Yukon, with the St Elias Mountain Range providing a continuous backdrop to our left. The Al-Can leg winds down back in Alaska at Tok Junction. The final leg heads south, first along the Tok Cutoff of the Glenn Highway. This beautifully paved roadway punches straight through the heart of the Alaska Range, which contains some of America's tallest peaks including Mt McKinley. We are lucky as a river carved an easier path through the range for us to follow. A couple of days later we intercept the Richardson Highway, Alaska's oldest highway dating back to 1902, when it was known as the Valdez to Fairbanks Trail. The Richardson takes us south to Valdez, through some of the best mountain landscapes in the world. From Valdez, we ferry across Prince William Sound and then on to Anchorage. The route follows four of North America's most scenic highways, the Haines, Al-Can, Glenn and Richardson Highways. 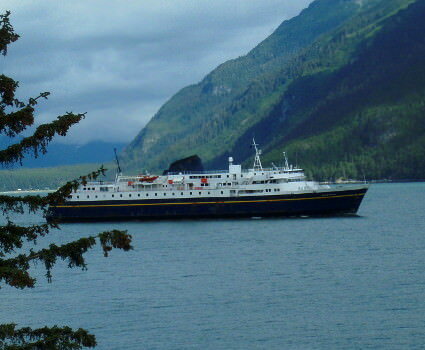 Depart Juneau by ferry through Inside Passage, explore Haines waterfront, enjoy dinner by the docks. Our adventure begins as you board the ferry M/V Malaspina for a scenic voyage from Juneau to Haines. The magnificent landscapes of the Inside Passage are sure to keep you glued to your camera. Perhaps you will see dolphins dancing in the bow waves or sea otter lounging in the water. Your guide team will be awaiting your arrival in the port of Haines and then transfer to our delightful hotel in the historic part of town. Bike through Chilkat Bald Eagle Reserve, see traditional salmon fishing wheels, return to Haines. This morning we gather for breakfast and tour orientation, then after assembling the bikes will explore Haines town the rest of the morning. Around midday we set off on our adventure, pedaling a leisurely 25 miles through the Chilkat Bald Eagle Reserve to Mosquito Lake and our first night camped under the vast Alaskan skies. Unlike riders on our annual Alaska Highway Ride who enjoy 24 hour daylight, we enjoy some hours of darkness for a good night's sleep. Bike into Canada, crossing Three Guardsman and Chilkat passes, camp by Million Dollar Falls. Our ride today is quite a contrast to yesterday's spin, as we roll deep into the spectacular mountains that highlight this section of the bike tour. Early in the ride, we pass through customs into British Columbia, Canada, following the Klehini River. Then up and over, crossing two passes (Three Guardsmen and Chilkat) en route to the Yukon Territory, our third state/province for the day. The landscapes along this stretch are unbelievable, with glaciers draped on mountain tops and cascading rivers dividing the ranges. We bed down tonight at the aptly named Million Dollar Falls. Cycle along Dezadeash Lake, to Haines Junction. Free day in Haines. More incredible scenery fills our final day on the Haines Highway, taking us along Dezadeash Lake and further north to the town of Haines Junction. In Haines Junction we will intercept the notorious Al-Can Highway, built in a short 9 months during World War II, which will guide us through the balance of the Yukon Territory. We will enjoy indoor accommodation in Haines Junction tonight. A relaxing day off the bikes is in store in Haines Junction. You might want to visit the Visitors Center for St Elias Park or relax on the porch of the bakery or maybe walk one of the area's hiking trails. Dramatic cycling along the St Elias Mountain Range, camp on the sores of turquoise Kluane Lake. Heading up the Alaska Highway (Al-Can) we continue to enjoy the beautiful St Elias Mountains to our left and untouched forested wilderness for as far as the eye can see to our right. Our goal today is the turquoise blue waters of Kluane Lake and Cottonwood Campground, one of the best campgrounds of all our Alaska and Canada trips. The mountains towering above the campground often have Dahl Sheep sprinkled across their upper slopes. 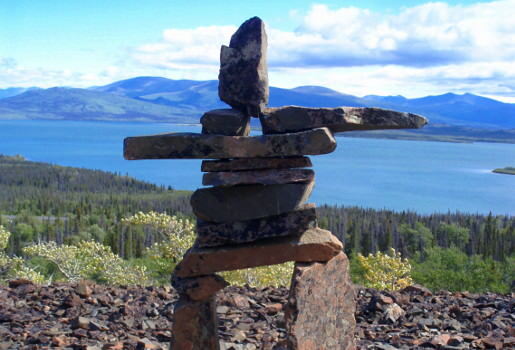 Explore the Natural History Museum of Burwash Landing, bike along Kluane Lake, camp at Lake Creek. Much of today's ride continues to roll along the shoreline of Kluane Lake, with a lunch time break at the Burwash Landing Natural History Museum. Afternoon will find us pedaling through the immense landscapes that characterize the next section of highway, untouched wilderness for as far as the eye can see in all directions. Tonight's campground is on the banks of Lake Creek. 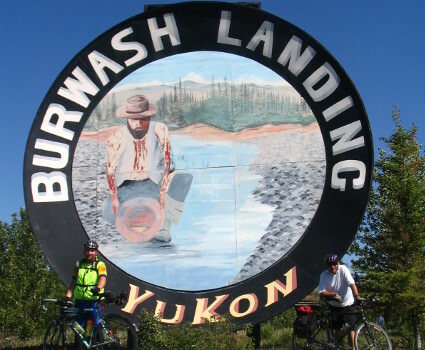 Cycle across the rugged tundra, to Beaver Creek westernmost town in Canada. Biking across Tetlin Wildlife Refuge, camp on the shores of Jagger Lake. We are heading back into Alaska today, after a break for photos straddling the border, we clear customs at Border Town. 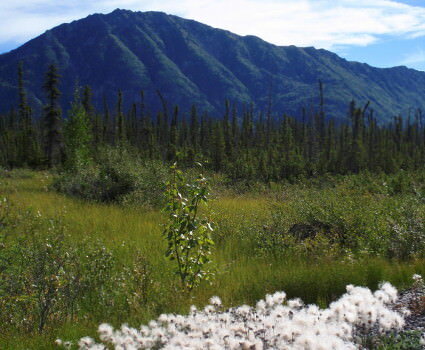 We will explore the Tetlin Wildlife Refuge visitor center at lunch, then continue to a scenic campground on Jaggar Lake inside the Tetlin Wildlife Refuge. Sitting on the lake shore watching the birds and muskrats go about their daily lives as the sun sets is truly magical. Last day on the Al-Can pedaling the pine forests to Tok Junction. Free day in Tok. 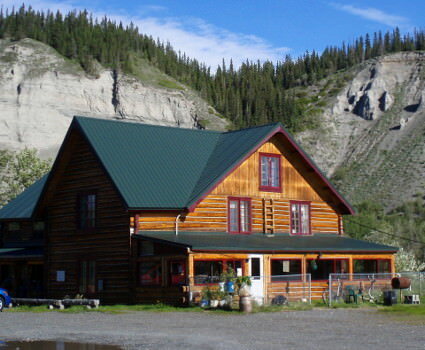 A leisurely day takes us to Tok Junction, a favorite watering hole for Alaska Highway travelers. Again the bikes have the day off and you can catch up on laundry or your diary, shop for souvenirs and gifts for the folks back home or perhaps get a few more miles in cycling more of the Al-Can to Moon Lake Park. 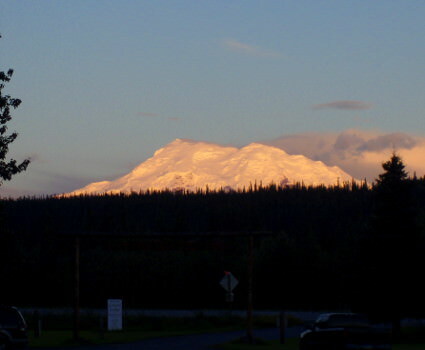 Bike through the magnificent Alaska Range, enjoy views of snow covered Mt Drum from our camp. 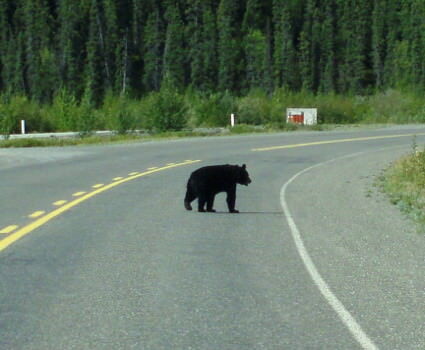 The third highway of our trip leads us south today, rolling down the Tok Cutoff. The ride starts flat and off in the distance the Alaska Range slowly rises into view. And while the range sports some of North America's highest peaks (including Mt McKinley), our route through it follows rivers for the most part and provides no major challenges ... but lots of photo opportunities. Tonight's campground is on a small ranch with beautiful vistas of the Wrangell Range. 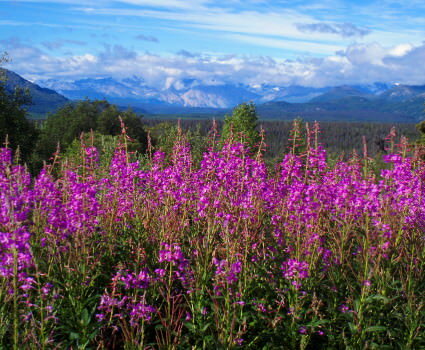 Cycle the Tok Cutoff to historic Gakona, the towering Wangrell Mountains to our left, the Alaska off to our right. With the Alaska Range fading from view behind us and the Wrangells growing in the distance ahead of us, we roll further down the Tok Cutoff passing the occasional roadhouse and lodge. We are on our way to the historic Gakona Roadhouse where we camp out on their lush green lawn (while the lodge has rooms, they are usually booked for crews of the Alaska pipeline for the summer). Bike past the dramatic volcanic peaks of Wrangell National park, Camp at the remote Tiekel River Lodge. A short ways into today's ride and we switch to our final highway of the bike tour, the Richardson, Alaska's first highway. We roll through Glenallen, the only city between Tok Junction and the ride's terminus in Valdez. Also along today's ride is Copper Center, an historic agricultural town, plus the informative visitor's center for Wrangell St Elias National Park. We bed down on another old roadhouse, this time at Tiekel River. 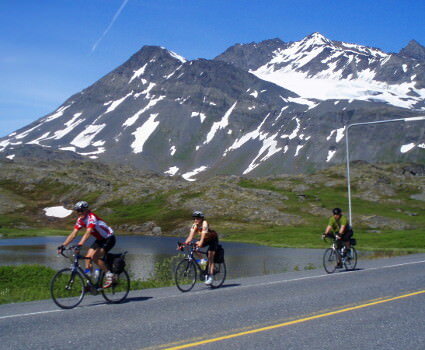 Alaska's most dramatic cycling, through the spectacular Chugach Range, Cross Thompson Pass for a finale descent into the fishing village of Valdez. The final ride for the tour is one of the most spectacular, taking us between the magnificent Chugach and Wrangell Mountains Ranges. The landscape is beyond being described as simply dramatic. Lots of photo ops will keep your camera busy, all the way to Valdez. We cross Thompson Pass and enjoy a spin through narrow Keystone Canyon, before reaching the fishing port of Valdez. 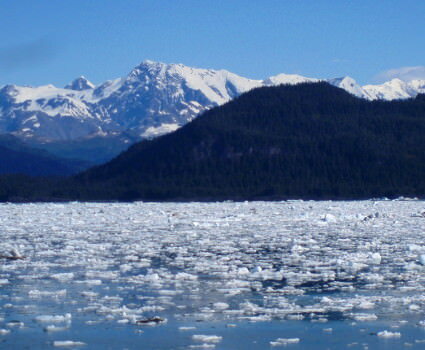 Ferry through Prince William Sound, Glacier viewing, Shuttle to Anchorage Airport. The trip ends as it began, with a ferry trip, taking us across Prince William Sound with its glaciers, icebergs and abundant sea life. Perhaps we will be blessed with views of the glaciers calving into the bay, seals and other sea life enjoying the ocean waves and more. After arriving in Whittier, we will shuttle you to Anchorage Airport or the Long House Hotel, where we all bid a fond farewell to our fellow Adventurers. Beautiful lodge built in the former officer quarters for Fort Seward. Luxurious small hotel situated under towering mountains. Canada's frontier comes alive in this log cabin lodge. Comfortable inn at the crossroads of Alaska bound travelers. Nice hotel on the edge of the fishing village of Valdez. The hotels listed here are our preferred properties, but may not be available for all dates. Our other nights are camping, all with hot showers. Fill in the blanks and the tour details for Alaska Yukon Adventure will be on their way.